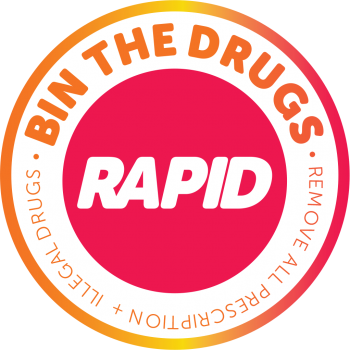 RAPID (Remove All Prescription and Illegal Drugs) is a health and community safety focussed partnership initiative supported regionally by the PSNI, Public Health Agency and locally by Drug and Alcohol Coordination Teams (DACTs) and Policing & Community Safety Partnerships (PCSPs) that promotes and facilitates the removal of all types of prescription and illegal drugs from the local community. Removal of prescription, illegal and new psychoactive substances (often referred to as ‘legal highs’ and now illegal following the introduction of the Psychoactive Substances Act in May 2016) from local communities. Provision of information and support to individuals, families, local business and community organisations to raise awareness of the effects and risks of using/misusing illegal and/or prescription drugs. Your local DACT Connections Service and Policing and Community Safety Partnership have worked closely with community partners and local businesses to identify a suitable location for the RAPID drug disposal bin in your area. 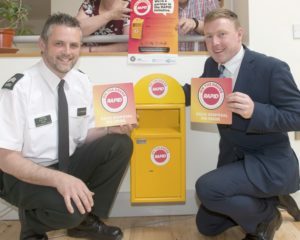 Should you have, or come across, unwanted or unused drugs (whether prescribed or illegal) you are encouraged to deposit them in the RAPID bin safely enabling police to then dispose of the drugs ensuring that they are out of ‘harm’s way’ for good. 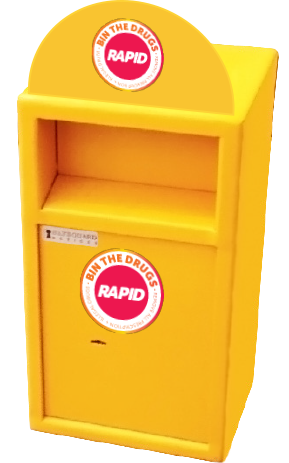 The RAPID drug disposal bin is purposefully located in a place designed to offer as much anonymity as possible to the person making the deposit. Police routinely collect and record information on the drugs deposited in the bins however no personal information is required or sought. In some instances, Police may need to conduct follow up enquiries in relation to a specific drug that has been disposed of – particularly where said substance has tested for high levels of toxicity and therefore presents a high and immediate risk to the public. There is no limit on the amount or restrictions on the type of drugs that can be disposed of using the RAPID bin – all we ask is that you don’t use it to dispose of drug-taking equipment – the bins are purely for the disposal of substances only (e.g. tablets, capsules, powder, et). What happens to the drugs handed in? It is the responsibility of the PSNI to regularly empty and record the contents (in relation to types and quantities of drugs that have been deposited) of the RAPID drug disposal bin. Once emptied and recorded, the drugs are then taken to a local PSNI Station where they are stored until they can be destroyed. Police may send some random samples (or a specific substance if there’s cause for concern) to the Forensic Service of Northern Ireland for verification and/or to assess their toxic quality.